IT was the moment she finally got out from behind her London desk and in amongst the action – and it cost James Bond’s M, played by Dame Judi Dench, her life. The matriarchal MI6 spy chief went out in a blaze of glory in her dramatic last ever scenes for the blockbuster franchise, fatally injured in a gunfight with Javier Bardem’s flamboyant villain and his henchmen in the latest Bond outing, Skyfall. But while clearly emotional at bowing out of the series, the acting dame was clearly thrilled that she got to fire off a few shots at the baddies before she went down, the only time throughout her seven-film tenure as M she got to show her credentials in the field. After shooting her final James Bond scenes as M in Skyfall, the Oscar-winning actress, famed for her Shakespearian roles, kept the four brass shells she discharged from her pistol and had them fashioned into gold cufflinks. She gave one pair to her 15-year-old grandson, Sammy, and another to her daughter Finty’s boyfriend for Christmas. Designer jeweller Roger Elliott, 63, gold-plated the cartridges and studded their tips with rubies. He created bullet-shaped end bars and engraved them with Skyfall, the name of Bond’s fictional childhood home in the Scottish Highlands where M dies in the arms of 007, played by Daniel Craig. Mr Elliott, from Redhill, Surrey, who has made a necklace and earrings for Dame Judi in the past, said: ‘She told me the cartridge cases were especially meaningful to her because they marked the end of her career as M. ‘She also said they were the only gunshots she ever fired on screen. 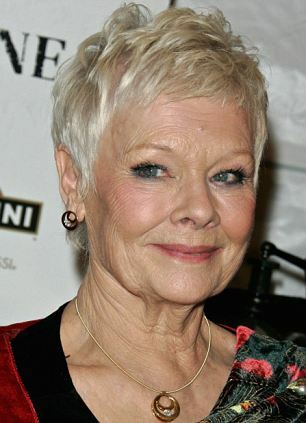 “Dame Judi normally plays more deskbound characters, so the action sequence was very unusual for her. ‘I made more of them than Dame Judi expected. She was delighted with the result. Dame Judi inherited the role of M from Robert Brown and before him, Bernard Lee. Her character, introduced in 1995’s Golden Eye, was loosely based on real life former MI5 head Dame Stella Rimmington. Her M was initially sceptical of Pierce Brosnan’s Bond and his womanising ways, branding him a dinosaur relic of the Cold War.The two eventually formed a close relationship, with M playing mentor and mother-figure, a bond that was cemented in their final outing together, in which her character is central to the plot. The actress, whose meatier M role in Skyfall has seen her nominated for a Bafta, has revealed that, just like her character, she was reluctant to give up the part after 17 years. At least she enjoyed her action-packed final scenes, in which Bond uses her as bait to lure Bardem’s vengeful former secret agent, Raoul Silva, to his isolated ancestral home – for a fight to the death.